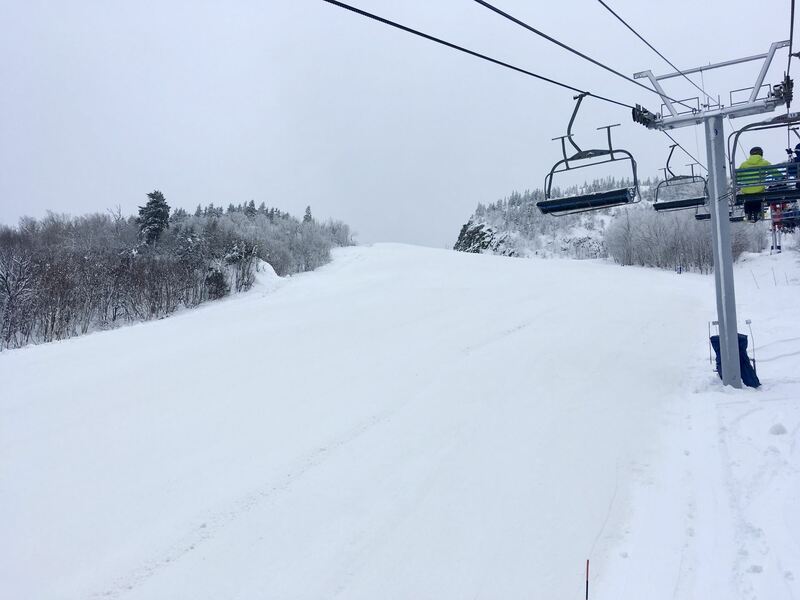 Mont Orford was the destination choice today to start off the 2018-19 season. There were other options that were thought of that involved a bit of travel, however I decided to stick to something nearby. This would be Orford's second weekend of operation. With the dump of snow this past week Orford was a good choice. All of Giroux North was open counting for about a dozen trails with the Giroux North Quad giving access. I arrived at the mountain at 8:45 under cloudy skies and the temperature hovering around 0 to -1 Celsius. I met up with an old friend of mine from my Owl's Head days so this venture was not a solo one. There was a decent crowd, but the wait in line was no more than a minute or so if that. I wouldn't even consider this a wait. Everything was flowing smoothly in line. 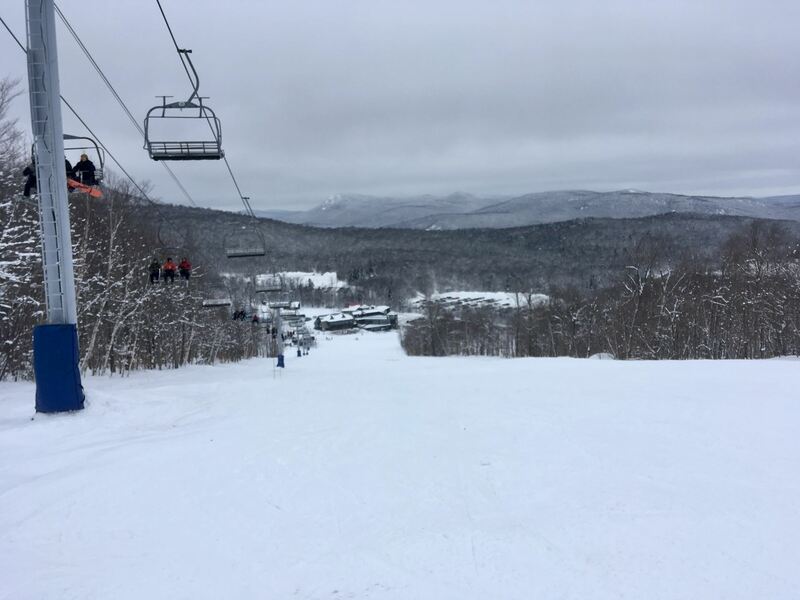 Today you were skiing on a mix of groomed man made and packed natural snow that was a bit damp from the mild temperatures that followed the storm. Nothing slushy or springlike, just good snowball making snow. Base was nice and forgiving. Majority of the trails open on Giroux North were on natural snow, with the exception of maybe one or two trails. Sure there were some spots that you had to be careful with and had to pay attention to, but the overall coverage was pretty decent for natural snow alone. It's what you would expect at the beginning of the season. The first run was down the Familale with the next down the Alternative into the l'Initiation, some other nice easy trails that led back to the quad. The Magog and the Jean-Davignon, the intermediate trails I skied today were a good test for early season legs and mine seemed to be happy with these choices of trails. After a few more runs, the last being down the Magog into the Pente Douce, I was done by noon. The legs weren't screaming, but I did start to feel it and decided not to push them any longer. 7 runs were enough for the first day of the new season. The Magnum was open as well but I took a pass on this one. We will get to it later in the season. It was a good first day out of hopefully many more of the season. Great report Paul. Conditions looked quite good. I like how you highlighted a couple of trails with your photos that I had never tried in my past visits. Once again, an amazing start for the new season. Hoping it keeps up for the next few months! I woke up early this morning to a beautiful sunny bluebird sky, so I made the decision to head out to Mont Orford. 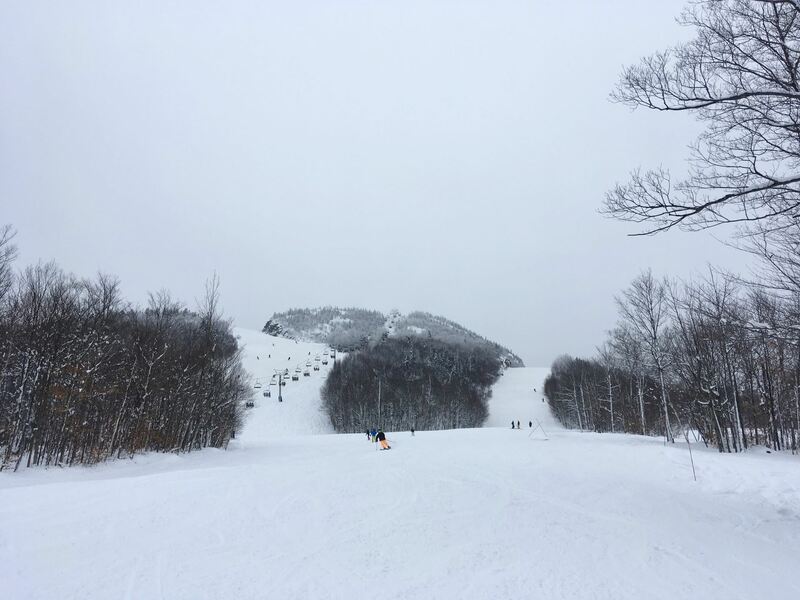 The mountain had received up to 40 centimetres of new snow Friday and into Saturday, so today was the day to go and see what they had. I arrived at the mountain a few minutes after 8 and the main parking lot was already filling up. The temperature was pretty mild at -2 degrees at the base of the mountain. It was quite windy as I was walking across the parking lot to the chalet, and was wondering what would be on wind hold. 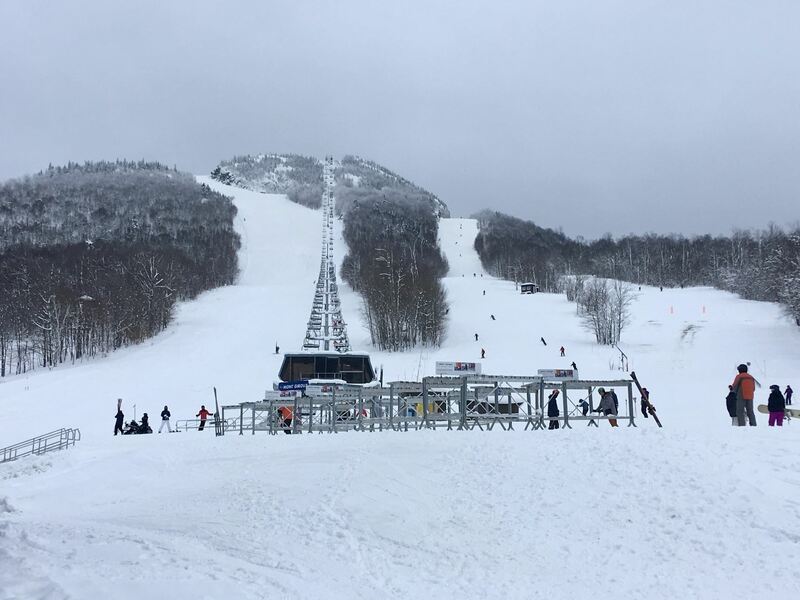 When I bought my ticket I was informed that the Alfred Desrochers double and the Rapido Triple were the only lifts open because of the wind. The access would have been up the Double and over to mid mountain to the Rapido to access the summit. While I was outside getting my skis on, I spoke to one of the Patrollers, and asked if there was anything on wind hold as I saw people lining up for the Hybride, and they said that it is windy but will be running the Hybride and the Giroux North chairs at a slower speed, and that Giroux East was on wind hold. OK.....That's what I liked to hear so it was go time! So with what lifts were confirmed, it was the Hybride for the first 3 laps to start the day. The ride up was a touch windy but with the sun out and a fairly mild temperature, it wasn't so bad. There was quite a cross wind blowing at the summit though. The first run down was on the 4km, a nice easy trail that is well protected from the wind. Then back up again for the Grande Coulee, and the third trip for a combo of the Trois Ruisseau and the Maxi. The conditions were excellent with a groomed packed powder over a firm base. The upper section of the Grande Coulee was windswept, however there was no ice. The ski down all three runs were really great. Then it was over to the Alfred Desrochers Double. I would almost consider this area of the mountain my favourite as it is all natural snow here. No snowmaking. This area is protected from the wind mostly, and the conditions were fantastic. More groomed packed powder. Here I made runs on the Grande Allee and then made my way over to the Giroux North Quad via the Toussiski crossing back under the Hybride. The ride up the Giroux North Quad was a touch windy. At the top it was quite windy where the snow was being blown around quite a bit, and the trails were actually icy at the beginning. As you skied off the summit to the lower sections of the trails, they were fine. I made a couple of runs on the Giroux North Quad with the Famillale and onto the lower part of the 4km, and the Magnum/Pente Douce combo. On the last ride up the Giroux North Quad I noticed that Giroux East was running. Being that I was on a 3 hour block ticket today I thought it would be the time to head down the Slalom. By this time it was 11:15 and time was running out. 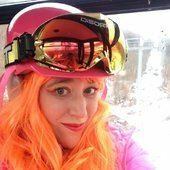 I started down the Slalom on packed powder, however I noticed the snow softening up on the trail, the further down I got. It was starting to get to be a little like springtime skiing at the bottom. The last ride of the day was up the Giroux East Quad as time was coming to an end with the last run down was again the Famillale/4km combo to the chalet. The ride up Giroux East was fine until you started getting towards the top were it was getting pretty windy again. I did the 3 hour block ticket today as the forecast for the afternoon was not that great. I started the day at 8:30 and finished the day at 11:45. The temperature by this time at the base was just a couple degrees above zero. The line up was not bad as I was using the singles line, and the wait was no more that 2-3 minutes tops. The line up at the Hybride was getting a bit long by lunch hour. I had skied what I had wanted to today with another great day of skiing in the books. Today's choice of destination was Mont Orford. What a beautiful bluebird sky! I arrived at Orford at 8:15 and the temperature was just below 0 but felt warmer in the bright sun. Spring was definitely in the air today. Parking was pretty decent and the walk was not long to the chalet. Crossing the foot bridge from the parking lot to the chalet, the brook was flowing with a strong current, and the sound of spring welcomed you to the mountain. The Hybride, Giroux North and East Quads, and even the double chair on Alfred Desrochers was in operation. The coverage was still pretty decent with a few typical spring icy patches starting to appear, along with some bare patches on Alfred Desrochers. The start of the day was on groomed granular snow on a firm base but that quickly softened up as the morning progressed. There is still snow in the woods but not all of the glade runs were open. The first runs were up the Hybride, and down the Trois-Russeaux, Grande Coulee, and the long easy cruiser, the 4km. At this time the snow was mostly groomed granular and the base was still firm, but in places you could tell it was starting to soften up. The next sector to ski was Alfred Desrochers. Here there is no snowmaking and the skiing is on natural snow. The coverage here was still pretty good, with one section that needed your attention as it was getting pretty thin on this one pitch. The rest was fantastic! Here it was classic spring skiing at its best. There are multiple brooks running through and they were starting to open up. The sound of the water rushing down the mountain was quite soothing as you rode up the chair. From here it was on to Giroux North and East. The snow on the Slalom was by now soft and definitely spring like. Coverage on Giroux East was still pretty decent. No bare spots, just the typical spring ice patch. The Sherbrooke was well covered and spring like. The day was excellent. The wait at the Hybride by late morning was not more than 5 minutes. There was pretty much no waiting in the singles line at Giroux North, with no wait on Giroux East. There was zero wait at the Alfred Desrochers double. I skied from opening at 8:30 until 12:30 taking my time and enjoying the scenery along with the terrific spring skiing. I finished the day skiing Alfred Desrochers for the last hour. The ride is a bit long but actually relaxing with the sounds of spring rushing down the mountain below the lift. The sound of a rushing brook while riding up was quite soothing. I find that this area of the mountain is one of my favorites and I find myself often heading over to this section to get away from the crowds. By the time I left the temperature was +6 degrees with a light breeze that felt nice riding up the lift. An Easter Saturday morning well spent.